Give your engine the good stuff! S&S® recommends that you change your oil and filter every 2500 miles or six months, which ever comes first. 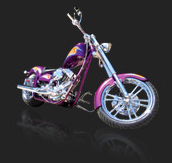 And to make it easy, we offer S&S Quick Oil Change kits. 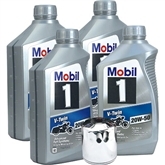 These kits include four quarts of Mobil 1® V-Twin 20W-50 full synthetic motor oil, the official oil of S&S Proven Performance® engines, and a premium chrome S&S oil filter. Everything you need in one convenient package. Available for Evo or Twin Cam models.